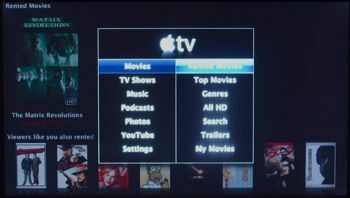 Apple yesterday released the delayed “Take Two” interface for Apple TV. We’ve gone through the update process and tested it out, and here’s our thoughts on the new functionality and interface, with an emphasis on social media. The update process is painless. 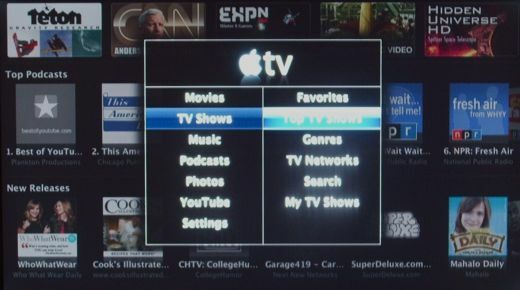 Navigate to Settings and choose Update Software, and Apple TV will take care of the rest. The total time for the update, including the download and install was around twenty minutes. The interface, as shown above, has been streamlined, and it is easy to get around. The main categories appear in the left column, and then options or categories appear in the right column. In addition, a Settings option lets you configure your Apple TV. 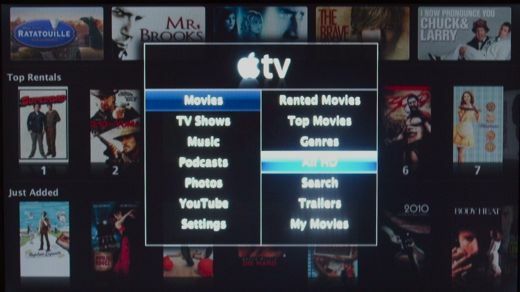 Three of the categories focus on buying or renting content from the Apple Store: Movies, TV Shows & Music. The remaining three are focused on your media or social media: Podcasts, Photos & YouTube. Select Movies, and you’ll see options for viewing movies you’ve rented, for browsing and searching for movies, for trailers and for viewing your movies. Note that Apple emphasizes renting and purchasing iTunes content above viewing your own content. Depending on your viewing habits, this may or may not be an annoyance. Renting movies is easy. 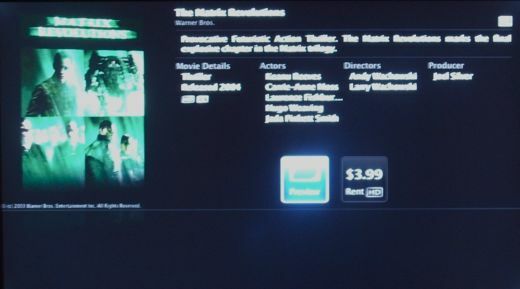 Find movies using several browsing and searching options, preview the movie you’re interested and then click the Rent button. We tested this out with the HD version of Matrix Revolutions. The purchase process was painless. It took about two hours to download the movie, and then Apple TV told us when it was ready to watch. Image quality was great. Unfortunately, the selection of movies, especially in HD quality, is very weak. Where’s the long tail when you need it? The next option is TV Shows. 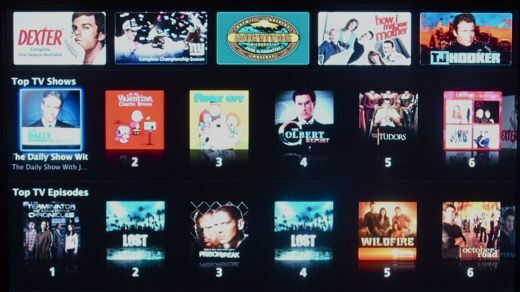 Again – the emphasis is on making it easy to find and view TV shows that you can buy on iTunes. All the top options are for finding & buying new content, and My TV Shows is relegated to last on the list. We tested this out by downloading a couple of TV shows. 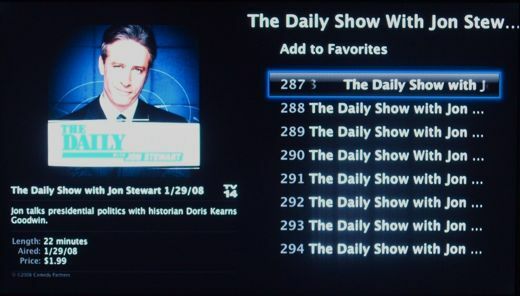 Downloads are much faster than the HD downloads – the shows were ready to view within a minute. Downloaded shows automatically synced back to the computer we have paired with Apple TV, too! The TV Shows section of Apple TV is well thought out, easy to use, and has a lot of content available. Five of the four option focus on finding and purchasing music from iTunes, and the My Music category is again down at the bottom of the list. This wasn’t much of an annoyance in the Movies or TV Shows categories, but it is here, since most users will spend a lot more time using their own music than buying new tunes from iTunes. Apple should have made accessing your music collection the focus of this category, providing more top-level options for getting at your music. Why no Shuffle Music option right at the top level? 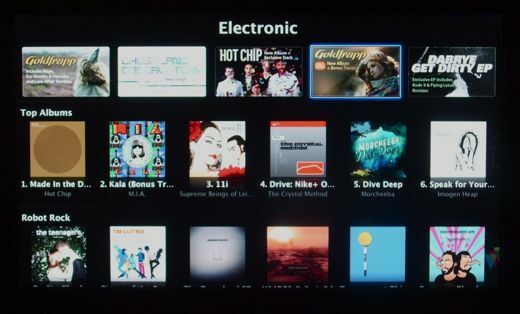 We tested out purchasing some tracks from iTunes on Apple TV. The process was fast and easy, the tracks downloaded quickly, and they synced up automatically with the computer we have paired with Apple TV. 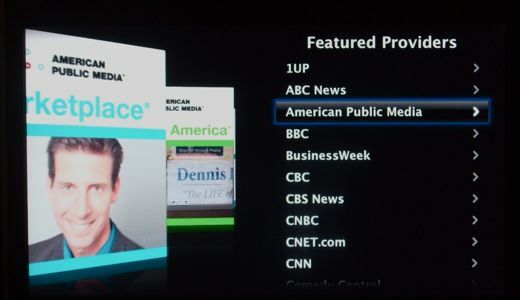 Now we start getting into the social media sections of Apple TV. The first option is Podcasts. Apple provides four options for finding new podcasts to check out, and two – Favorites & My Podcasts – for accessing your podcasts. Find a podcast you like, and you can add it as a Favorite, which makes it easy to access on the Favorites list. While the Podcasts section is easy to use, it fails to deliver in several ways. First, is the interface itself. It’s confusing what the difference is between Favorites and My Podcasts is. It’s not clear why you’d add a podcast to one and not the other. 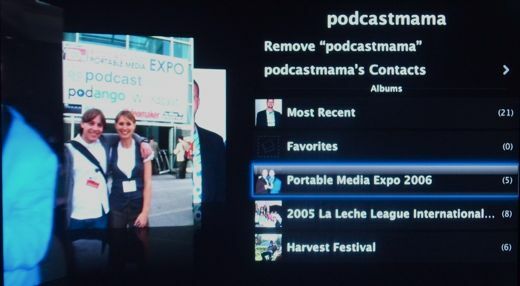 An even bigger issue is that Apple TV hides the scope of podcasts that are available. While you can browse through a couple of dozen Top Podcasts, there’s nothing that would tell a casual user that there are tens of thousands of more free podcasts available. The podcast category is one where My Podcasts should probably be one of the top options. You’ll spend a lot more time viewing or listening to podcasts on Apple TV than browsing for them. 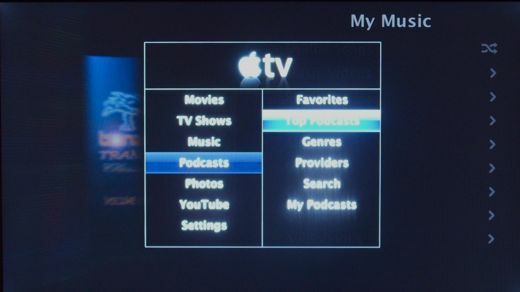 Finally, Apple TV mixes video and audio podcasts together in its interface – which means that you have to wade though a hundred thousand audio podcasts when you’re looking for a video podcast to watch on your TV. This is a major usability flaw. 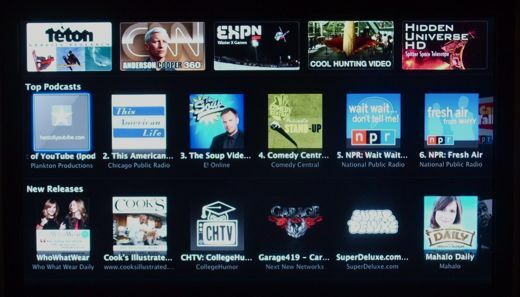 People are going to want to watch great video podcasts on Apple TV. Most people will listen to the audio podcasts that they like on an iPod or iPhone, or while they do other things on a computer. Mixing this all together in the Apple TV interface makes things confusing and makes it harder to find great video podcasts. Apple needs to revisit this and break out the audio podcasts from the the video podcasts. 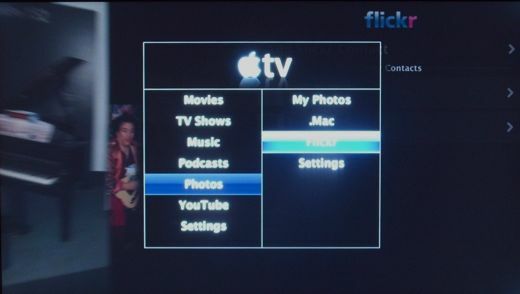 Next up in the Apple TV interface is photos. Here, the My Photos option is suddenly up at the top. Why is the “My xxxx” option at the bottom everywhere else? Who knows? It makes sense to have My Photos at the top here, though, because it gives you immediate access to your pictures. It would have been nice to have a slideshow option at the top level, too. The Flickr options are limited. 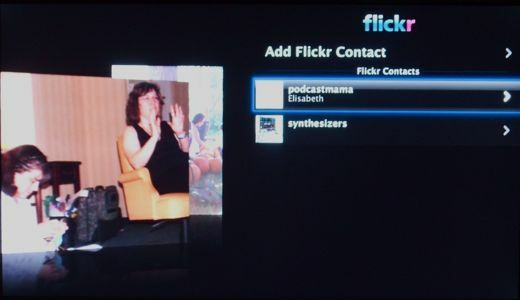 You can add Flickr contacts – but you can’s do things like subscribe to a keyword. We’d like to see more options for Flickr. The last Apple TV category is YouTube. 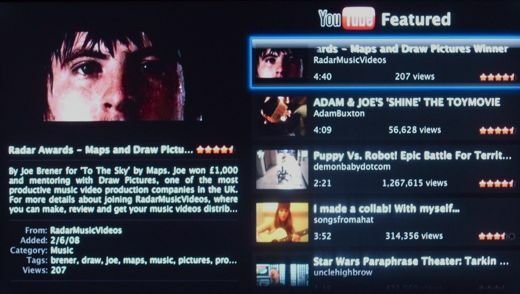 The YouTube features haven’t changed that much since the original Apple TV. The emphasis here is an browsing and viewing other people’s YouTube video, which makes sense. There are options for viewing the Featured videos, Most Viewed, Most Recent & Top Rated videos. You can also Search for videos. You can view Favorites and Subscriptions, but there’s no option to view your own videos. 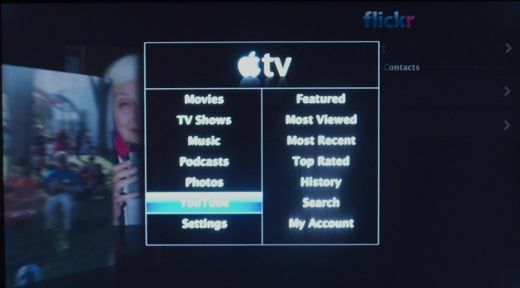 A lot of users would probably like to see their own YouTube videos on Apple TV, without having to search for them. And why isn’t Favorites a top-level option under the YouTube category, like it is under Podcasts? The lack of consistency in the interface is unusual for Apple, and is more than a bit confusing. YouTube videos load fairly quickly, but the quality is mediocre. 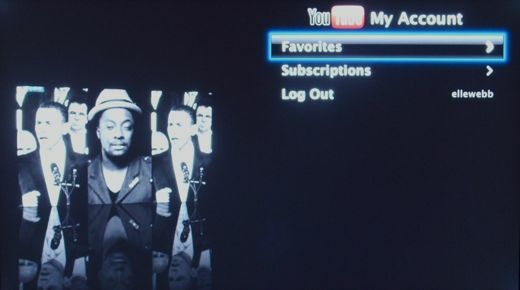 Still, it’s a great option to be able to view YouTube videos on your TV. While there’s still a lot of room for refinement with Apple TV, it’s a great update to the device. It repositions Apple TV from being an iTunes peripheral to being an Internet set-top box that syncs with your computer. 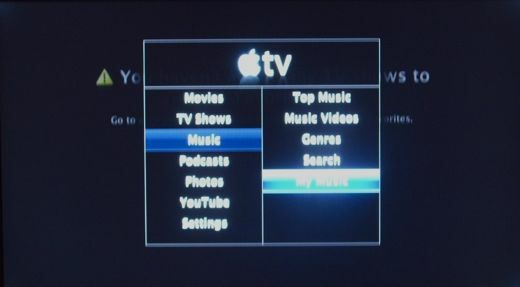 As an interface to the iTunes store, Apple TV works well, and makes the device a great way to get content onto your TV. The lack of selection in the Movies category is a big problem, though. Apple needs to work on getting more content available asap. The movie rental restrictions are too draconian, too. You have a month to watch movies that you’ve rented, but, once you start, you only have 24 hours. This is going to be a problem for a lot of people. Apple needs to give you at least three or four days to watch movies. Finally, the upgrade points out two existing hardware problems with Apple TV that I’d like to see them fix. First is the lack of a keyboard. While Apple’s remote is a no-brainer, it’s terrible for entering in text. Apple needs to make an optional keyboard available. Second, if you start renting movies that are good for 30 days, you’re going to run into space issues pretty quickly. Apple needs to support hooking up USB hard drives to Apple TV. While we’re very excited about the upgrade, there are enough problems with the interface and the devices functionality that we can only recommend it with qualifications. With a few more interface tweaks, a deeper movie rental library and consumer-friendly rental restrictions, Apple would have an unqualified winner on their hands. Got an Apple TV? Let us know what you think in the comments. Gizmodo and AppleInsider offer their takes on the update. Nice overview – but I think Apple still missed the ball on this. If they put a DVD player in it, made the hard drive about 500 gigs or so and let you rip your own DVDs, it would be killer. Thank you for the in-depth look at the podcast section. It’s really too bad that while they have been a great boon to Apple for selling their content players, they will always be the un-loved ugly step-child of the content family. Loving the Apple TV! Over at the Association for Downloadable Media we are starting to look at this, as Don McAllister nicely puts it, as a “game changer” for podcast viewing and listening. I have personally founds lots of content via “couch-streaming” that I never would have if I was stuck at the computer. I love the new update, though it would have been a great idea to allow more control with “My Music”. 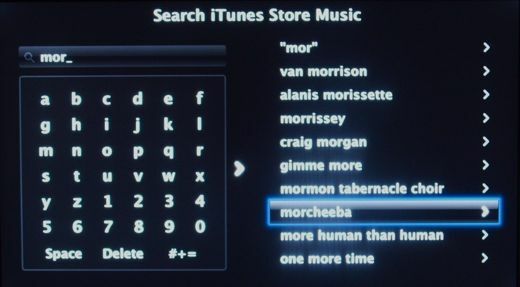 There’s a search for the Itunes music store, though you can’t with your own library? 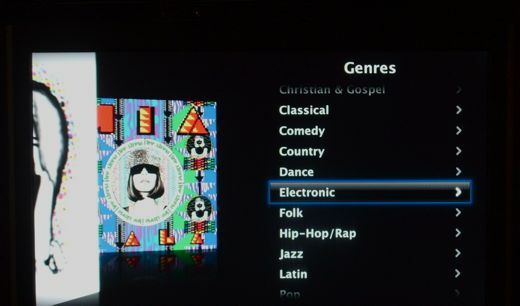 Would also be nice to build playlists from the apple tv as well. I built a very quiet HTPC using an Antec Fusion case and a Fatality Mobo with HDMI out, after spending some time configuring Girder and USB/UIRT etc. it works very well. The HTPC is undoubtedly superior to the Apple TV, but it cost much more, especially after factoring the time and effort (many hours spent toiling with hardware and software configuration, many many hours). Anyway, I bought an Apple TV on a whim and I have to say that despite a few drawbacks, I use it all the time and the HTPC now remains switched off. The need to be hooked to a very fast connection and a TV at the same time is a deal killer. Mine aren’t on the same floor and wireless on my other floors is simply slow and this device frequently loses it’s connection. I already have a large library & would like to watch them on my upstairs tv but 4 hours to transfer 1 movie is unacceptable. It should have been designed with the ability to sync just like my IPOD’s. Waste of money.